Finds of Roman metalwork and pottery have been recorded from fields around Tai Cochion, close to the Anglesey shore of the Menai Strait , both in recent years and in antiquarian accounts. These were assumed to indicate the remains of a high status Romano-British site. The area was subsequently investigated by Gwynedd Archaeological Trust during three phases of geophysical survey that were mostly grant-aided by Cadw. The first was part of the pan-Wales Roman military sites project (Hopewell 2009, GAT report 778) the second, part of the Anglesey AONB (G2076) project and the third, funded by a Cadw contingency grant, again part of the Roman military sites project (G1632). In excess of 20 hectares was surveyed most of which was found to contain elements of an extensive settlement. The settlement comprised a 0.6km long road with several side branches, running from Tai Cochion house to the shore of the Menai Strait . The roads were flanked by a series of small enclosures, with typical dimensions of about 20m x 40m. Many of the enclosures contained fairly clear, rectangular anomalies interpreted as buildings, with typical dimensions of around 16m x 8m. About 25 possible buildings were detected by the survey. Most appeared to be rectangular, possibly with internal subdivisions. A few seemed to be more complex with extensions or additional rooms. The western and southern parts of the settlement were fairly regular with one building in each plot. The northern and eastern parts were less regular and more difficult to interpret. This could indicate either the presence of several phases or an area of different activity. Scatters of possible thermoremnant anomalies throughout the settlement could indicate hearths ovens or furnaces. The plots appeared to be defined by small ditches but there were no obvious signs of substantial defences around the settlement. Several phases of fields were detected to the north of the settlement. Some could be identified as boundaries shown on an 18th century estate map but others could be associated with the settlement. A surface finds collection comprising 207 sherds of Roman Pottery was made in the field to the south of Tai Cochion. These were examined by Peter Webster and were found to have a date range of c. AD 100 to c. AD 300 including a high proportion of high-status 2nd century material. 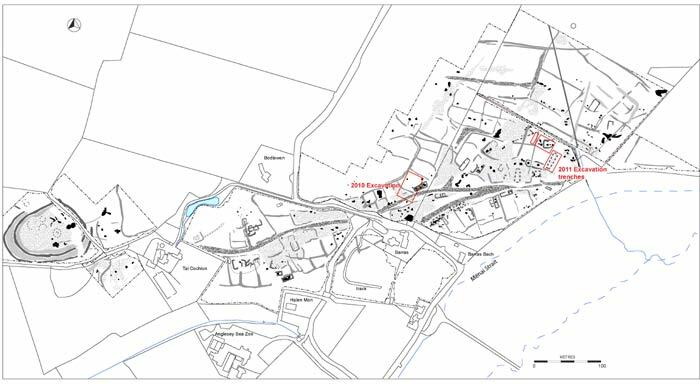 The geophysical survey results and finds strongly suggested the presence of a Roman settlement of some importance, as opposed to a Romano-British roundhouse settlement suggested by earlier studies. 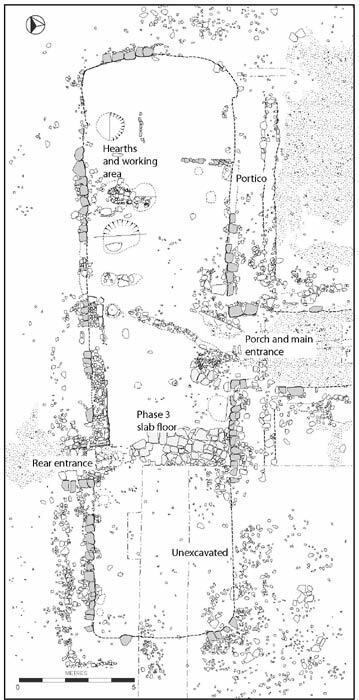 The layout, with a central road flanked by plots containing rectangular buildings, is similar to Roman villages and small towns such as Sedgefield near Durham (Info from Dr D. Mason in Burnham 2007). The position of the site on the opposite side of the Menai Strait to Segontium Roman fort suggests that the settlement marks the crossing point of the Menai Strait . It is likely that a settlement would have grown up around the landing place and that it would have functioned as a trading point with the inhabitants of Anglesey . This is the first settlement of this type to be discovered in the supposed Roman militarised zone of north and western parts of England and Wales. A 40x20m area of assessment excavation was carried out in the summer of 2010. This confirmed the interpretation of the geophysical anomalies: An eight-metre-wide road of typical Roman construction crossed the south-eastern corner of the site. To the west of this was a 14m x 5m rectangular building, probably with stone foundations and a wood, wattle and daub superstructure. This had been burnt down and appeared to have been substantially robbed of building materials. The plot ditches were found to be relatively slight and would have functioned as boundary markers and drains and did not appear to be defensive in nature. The building was separated from the road by a metalled yard. The area to the west of the building contained pits, patches of burnt material and a six posted granary. Close to 1000 sherds of pottery were recovered, with a date range from the early second-century through to the mid-fourth. A second more extensive excavation was carried out in the summer of 2011. It was decided to target one large building close to the Menai Strait along with a series of geophysical anomalies that had been provisionally interpreted as industrial features. A 60m x 60m high resolution (50cm x 25cm sample interval) fluxgate gradiometer survey was initially carried out allowing the trenches to be accurately positioned over the features. The excavation was carried out over 7 weeks commencing on the 27th June 2011 . 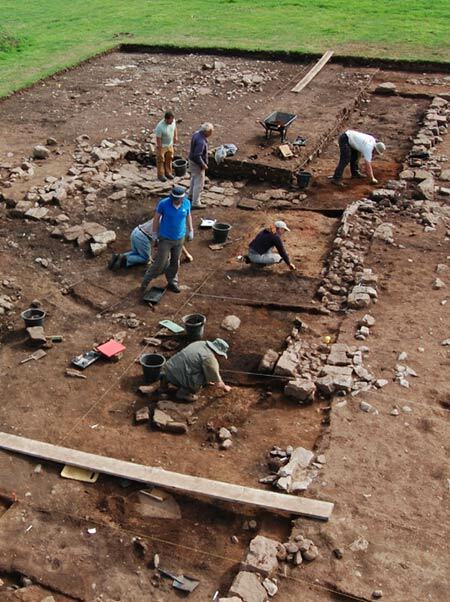 The excavation was supervised by David Hopewell and George Smith, both senior archaeologists at GAT and staffed by a team of volunteers that included several experienced archaeologists. A GAT outreach team also led visits by 10 local schools. An open day was held to coincide with the Festival of British Archaeology attracting over 500 visitors. A presentation was also made to the Association of Roman Archaeology Annual Summer Tour. Trench one, with dimensions of 30m x 15m, investigated a geophysical anomaly interpreted as a large building. The excavation revealed a rectangular building with bowed ends and dimensions of 27m x 9m. The remains of stone footings defined the main wall lines and considerable amounts of heat-affected clay indicated that it had a wood and wattle and daub superstructure. The building was surrounded by a veranda or possibly a corridor. A substantial 3m wide entrance with a covered porch was centrally placed in the eastern wall facing the Menai Strait . The building was divided up in to three main rooms. A large room, centred on the main entrance, contained evidence for domestic and perhaps craft-working activity. Initial analysis suggests that smaller rooms at either end of the building had principally domestic functions. Two phases were identified. The earliest had a sunken clay and small cobble floor and was seriously damaged by fire. A flagged floor was laid over the remains of the first phase and the building was at least partially re-used. Trench two contained a series of cut features. Most were irregular hollows which may have been borrow-pits for wattle and daub making. A stone lined pit appears to have functioned as a grain dryer. In excess of 2500 finds were recovered from the excavation including pottery, coins, jewellery and metal furniture fittings. A further hectare of geophysical survey was carried out at the western end of the site showing details of a large prehistoric defended settlement. The settlement is sub-circular with dimensions of 130m x 100m and is defended by a double bank and ditches. A series of circular anomalies in the interior could indicate several phases of round houses. The probable course of the Roman road runs immediately to the south of the ditches and the entrance appears to open onto the road. This could either indicate that the Romans adopted a pre-existing Iron Age trackway or that the settlement belongs to the Romano-British period and was contemporary with the road.